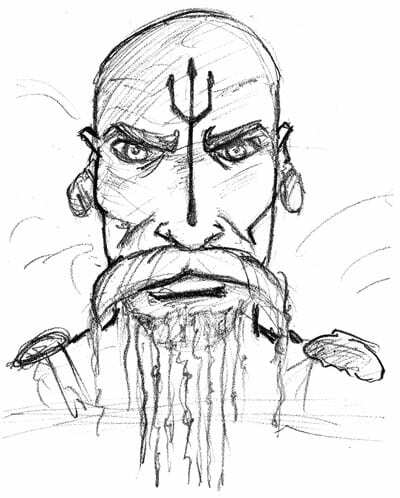 Day 2 of the 2010 Challenge and I’m continuing with the Greek Pantheon with Poseidon. It was also brought to my attention that I should do a little more than just say their name and post a drawing (great idea, Christi!). So I’ll tell you just a tad about Poseidon. Poseidon was one of the brother’s of Zeus (king of the gods) and when Earth was divided among the brothers, Zeus ruled the land and air, Hades ruled the underworld, and Poseidon drew the oceans and seas as his domain. A pretty big domain at that! What I found interesting is that he was also known as the God of Earthquakes AND God of Horses! Apparently, seafarers would sacrifice horses to Poseidon to ensure safe sailing. Poseidon was very moody. Thus, new lands could spring up from the ocean (undiscovered islands), as well as tempests and tidal waves. Doing these creative ‘pieces’ in 15 minutes IS a challenge. I’m STUNNED by the quality of other people’s posts, though I will claim a bit out of practice in my drawing skills of late. My Poseidon is a cross between an old salt and a Jimmy Buffet character drinking margaritas. Suntanned. Sea-shells for jewelry and clothing apparatus. And the mustache a kind-of walrus look, with a stringy beard of sea-weed. Not to mention the trident tattoo. The trident is a symbol of Poseidon. Cool – and much more satisfying having some of the ‘backstory’!